Do you live with intention? Do you get up every morning with a plan or goal in mind? Is your day laced with a self-serving attitude; or do you actually see the other people around you? How do you see your life? Is it going anywhere? Or are you just muddling along until something finds you? 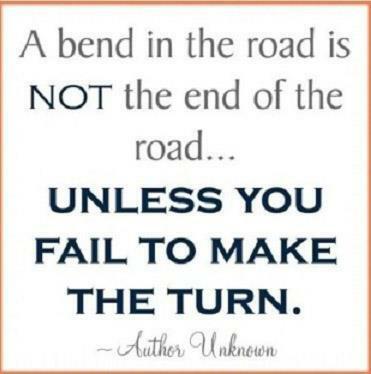 HOW MANY OF YOU ARE FAILING TO MAKE THE TURN? If we are still in the healing process, we could still be just muddling along. I know it is hard to take that next step or to make that turn. I remember it being one of the hardest things I did. We have to have intention and purpose to our existence in order to grow and live our life. Look back at what I wrote yesterday. Do we surround ourself with the right people? We may think we are in a good relationship but if we are not moving forward with our life, if we are still in that same job we hate, making the same money, and barely making it financially, and just existing with a few good times here and there, then what are we doing? What are they doing to help us with our intentions and purpose for our life? In order to move forward with your life with intention and purpose, you may need to let go. Trust that God is with you. He will catch you if you think you are falling. Faith in him is what saved me. Move forward with intention and really live your life! !